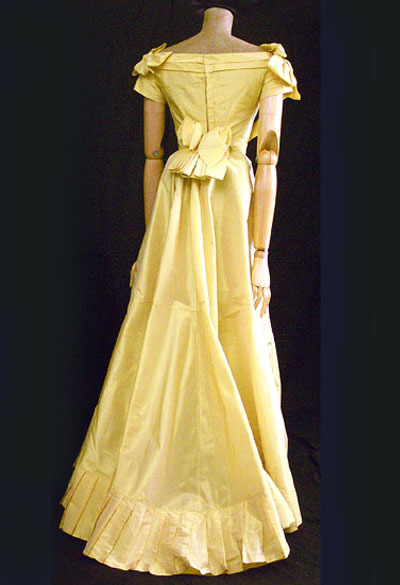 This lovely ball gown is fashioned from unfaded gold taffeta. The color is as fresh and glowing today as when worn by the owner to her first ball. What a wonderful period piece! The hand-sewn bodice features a wide neckline, shoulder bows, and short pleated sleeves. The bodice is boned and lined with ivory-polished cotton. The sleeves are set in with narrow piping, and the bodice hem is finished corded piping. The bodice closes in back with hooks. The unlined skirt is cut longer and fuller in back. The hem is bordered with a pleated hem flounce. The sash is of matching gold moiré ribbon with scalloped satin edges. 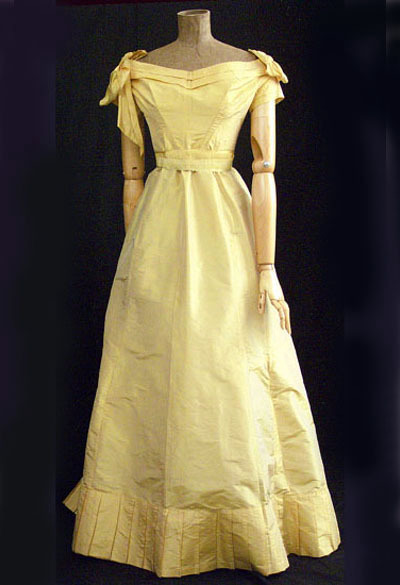 The gown was photographed with an exterior bustle of almost matching silk beneath the sash, which is not included. 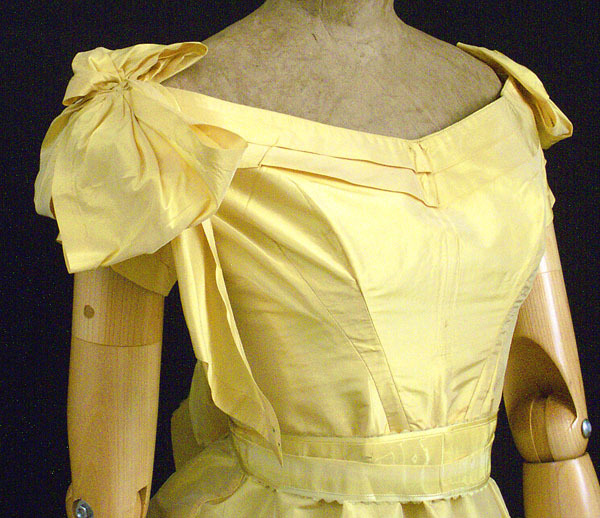 I will include an additional long sleeved bodice (damaged under the arms) that originally came with the gown. The condition of the gown is almost excellent. There is faint discoloration on the skirt, probably from storage. Otherwise it is structurally sound and displays beautifully. The gown measures: 34" bust, 24" waist, and 43 1/2" skirt-front length.